April the giraffe has captured the hearts of millions of people from all over the world from the very moment the live stream of her pregnancy hit the web. 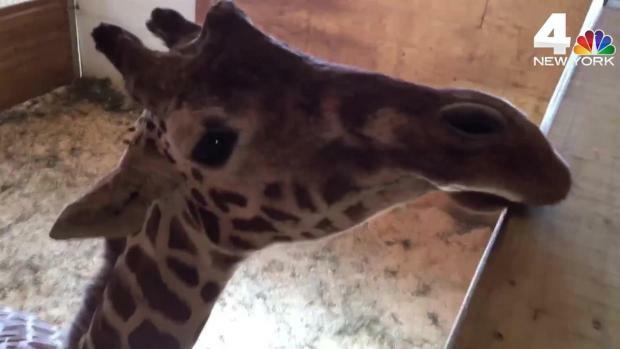 Although it seems like it's taking forever for the birth of April's fourth calf, which will be the first born at Animal Adventure Park in Harpursville, New York, this is normal in giraffe pregnancies. 1. Giraffe pregnancies last about 15 months or 453 to 464 days. 2. A baby giraffe is called a calf. An adult female giraffe is called a cow and a male is called a bull. 3. The front hooves will come out first followed by the snout. 4. A baby giraffe is born at a whopping 100 to 150 pounds and stands 6 feet tall. 5. Mother giraffes wean the baby giraffes for 6 to 10 months. 6. They grow up so fast, literally. A baby giraffe begins walking about 30 minutes to an hour after birth. The first steps are vital for it to nurse from the mother. They can even run within the first day. 7. Baby giraffes nurse for nine to 12 months but can begin eating solids like leaves, hay, romaine lettuce and carrots after four months, much like humans. 8. Male giraffes will stay with their mothers for 15 months before leaving to form a group with other males. Females leave their mothers around 18 months but continue to live with their herd. 9. In the wild, giraffes often give deliver in the same "calving ground" they were born because the herd continues to use the same land for several generations. 10. Their lifespan in the wild is 10 to 15 years but they can live to 27 in captivity.